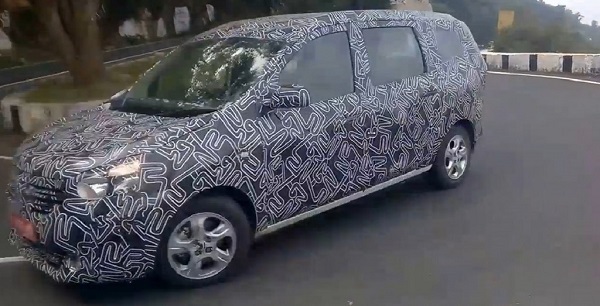 Renault India plans to launch the lodgy MPV in our country and ahead of its Indian debut, the car has been spotted testing on our public roads by Youtube user Swagat Tushar. The Renault Lodgy India launch is expected to happen in the second quarter of next year and the new model will rival models like the Chevrolet Enjoy and the Nissan Evalia here in our country. The Lodgy shares its underpinnings with the very successful Duster and this should translate into a competitive price tag when the Renault MPV finally makes its Indian debut. Our guess is that the Renault Lodgy price in India will start at INR 7.5 lacs, with the flagship trim positioned a little higher than INR 10 lacs. The Lodgy for our country will carry subtle design changes and the minor re-design would be done at the car maker’s design studio in Mumbai. Our guess is that the India spec Lodgy would get more chrome and a slightly different radiator grille. Production of the Lodgy MPV in India could start around the end of 2014 and the upcoming model will be manufactured at Renault-Nissan’s production plat in Oragadam. Much like its underpinnings, the Lodgy will also share its engine with the Duster. This means that the Lodgy would be sold in India with the tried and tested 1.5-liter K9K diesel engine that is offered with the Duster in two power states – 85 PS and 110 PS. While it is very much for sure that the 85 PS version would make it to the engine bay of the Lodgy, it is yet to be seen if the MPV would also get the more powerful 110 PS version with a six speed manual transmission.